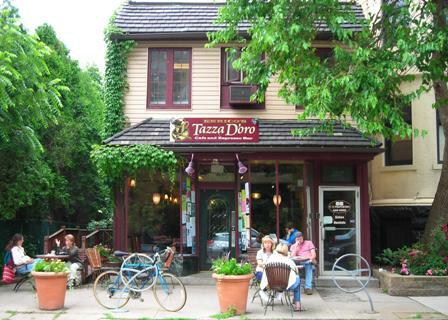 On Monday, June 23rd Tazza D’Oro will celebrate NINE YEARS of being in business, making great coffee and hanging out with our people. In many ways it feels like it was just the other day that we opened and when I think back to all the experiences and memories then nine years is about right. I was telling Amelia about the first day of business – I was so nervous the night before that I asked Stephan and Kara to show up the next morning at 5 am even though we didn’t open for business until 7am. We had practiced and trained for 2 weeks before we opened so on the first morning we got everything done in a half hour. We didn’t know what to do with ourselves for the next hour and half so we re-cleaned and rearranged the whole dinning room for the hundreth time. Kara and Stephan were awesome – totally organized and confident. Then, finally our first customer – a large coffee and cinnamon roll, we rang them up and realized I forgot to put any money or change in the register. YIKES. BTW, our first day was one of the best days of my life and I will never, ever forget it. Thank you to all the current and past Tazza D’Oro staff, Batdorf and Bronson, our coffee roaster, the Highland Park community, the Highland Park CDC, the great Senator Ferlo, ELDI, my family, friends and to all you great coffee lovin’ customers. I am reminded everyday how lucky I am to have Tazza D’Oro and to be surrounded by such awesome staff and customers. Mille grazie! 10 years in and it's the best the shop has ever been. That's a good trend! Good on you guys and thanks for being my "local" shop for all those years. Chris - you have been one of our originals and regulars. Thank you for your business and helping us raise the "bar". Plus, your racing bikes leaning against our front entrance always made Tazza D'Oro look really rad! Thank you. Happy Anniversary! Congratulations and thank you for becoming an indispensable part of the neighborhood and, even though I'm not a biker, a rad place to go. Thanks for the the vision and the elbow grease! Great job Tazza D'Oro and Amy! You've helped up the quality of life in Pittsburgh in so many ways. Here's to many more years of success. BIG BIG congrats to you, Amy, and your wonderful support team. As a fellow small business owner, I know the trials and tribulations. Boy do I know them, and you should be quite proud to have stayed afloat in todays business climate. I couldn't be happier for you girlfriend. Here's to 9 more and then some! Just had a surprise call from Deb and Jim, who spend their summers in Colorado, singing Happy Anniversary(amazing we stay in business while they're gone). Thanks guys, what an awesome surprise. Tazza d'Oro is my total favorite. It makes the neighborood more neighborhoody, more friendly, more classy and the coffee is out of this world! Many happy returns!